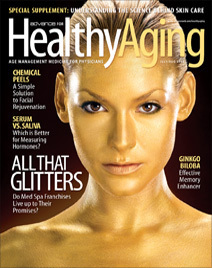 This month's Healthy Aging Magazine has an article on Medical Spas titled 'All That Glitters'. It's a good article in which Medical Spa MD is introduced in the first sentence. It seems that the community here is making some waves among members of more 'mainstream' press. Here's the email that I first received from Healthy Aging about the story. Healthy Aging is a bi-monthly trade magazine that provides credible information to dermatologists, cosmetic surgeons and physicians in age management medicine. We are writing a cover story to educate physicians about med spa franchises. The article will go through the pros and cons of getting into med spa franchises based on physicians’ experiences and research. It will also include information about what physicians should consider before buying a med spa franchise. I have been gathering a lot of information from your blog. Do you know if any of the posters would be interested in participating in the article? I'd also appreciate any information you'd like to share. When I have some time I'll put up some quotes from the article, but it seems that some of our common contributors are already mentioned. Medical Spa MD is given credit for the formation of some sort of cabal. If anyone has the article, post your favorite quote in the comments. I've got the magazine around here somewhere but it may take me a while to find it.